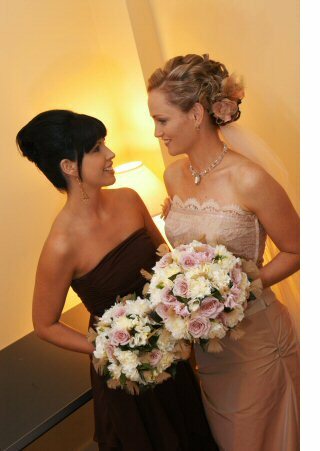 Your bouquet will be one of your most important accessories, it will be admired throughout all of your photos. It should be chosen with care, so that it complements your gown and the wedding theme. Most importantly it should reflect your personality. Bliss can create a bouquet to suit you � whether it be romantic, modern, wild, wistful, traditional, fun or daringly different. What your bridesmaids carry is totally up to you. The bouquets can be identical, similar or totally different. Traditionally they are similar to the bride's, slightly smaller and the colours different. Buttonholes are usually worn by the groom, the best man and groomsman. It is also traditional for the fathers and grandfathers to wear a buttonhole. The groom usually wears a single flower to match the bride's bouquet and the best man and the fathers wear a single flower to match the bridesmaids' bouquets. You may wish to add a modern or personal touch to the buttonholes by adding something unusual such as tortured willow, dodder vine, berries or gold leaves. Corsages are usually worn by the mothers and grandmothers. As with all your wedding flowers what flowers are used is totally up to you. You can have the corsages matching the wedding flowers, complementing the wearers clothing or you could have your mother's favourite flower. There are several classic shapes of bouquet and good florists have a selection of photographs and magazines to demonstrate them. The bouquet is held just below waist level. If this is likely to obscure a feature of the dress which the bride particularly wishes to be seen then she can choose a bouquet which lies across the arm. As a general rule large bouquets suit formal, long dresses while smaller bouquets or even a single bloom are more in proportion with a knee-length dress. There are several styles of bouquet, each of which are detailed below. What style of bouquet will suit you best? This will depend on how tall you are, your body shape and the style of gown you will be wearing. If you are full figured then a small bouquet would emphasise your waist it would be best to choose a larger style bouquet. A trailing bouquet will draw the eye from top to bottom and therefore has a slimming effect. A smaller round posy would draw attention to the middle of the body. If you are getting married in a garden or outdoors and wearing a cocktail style dress you may wish to consider a sheaf of flowers or a loosely wired trailing bouquet. Traditionally, all white flowers with touches of green foliage have been the most popular bridal bouquets. These can look very effective but make sure the white of the flowers matches perfectly. If your dress is stark white, the flowers may look creamy against it. Pastel shades of pink, peach, yellow and mauve can also look very delicate and are usually mixed with white flowers. Bold coloured flowers such as Singapore orchids or bright red roses can also look stunning. When deciding on your colour take into account the colour of your bridesmaids' dresses. You might like to pick out a colour from their dresses or a trim from your own dress to echo in the flowers. Set out below are the main types . . . Hand Tied, Trailing, Arm sheaf. The Hand Tied Posy features the natural stems of the flowers being exposed — it is suitable for a less formal wedding. Hand tied bouquets can be either formal or informal. Formal styles are most aptly described as 'tidy' or 'tight'. The type of flowers chosen also contributes to the degree of formality of the bouquet. For example, an all-rose posy will look far more formal than an assortment of Spring bulbs. Informal styles are much more casual in style. The edges are softer or less distinct than the formal posy. Rather than a precise, round shape, the informal posy can have an unstructured appearance, although it is still of a rounded shape. A mixture of different flowers and foliages are usually chosen for this style. this style has a posy top but the trail tapers until it forms a point at the end of the bouquet, which forms a teardrop shape. It can be either long or short, depending on your individual taste. Teardrop bouquets are generally considered to be very formal. this style of bouquet is wild and free with multiple trails that can feature stems of ivy, orchids and vines intertwined with flowers. It can be as structured or unstructured as you prefer. The contemporary cascade is perfect if you are wanting a romantic, free and tumbling look. All trailing bouquets can be formal or informal — the more foliages are used and the more unstructured and flowing it becomes, the more informal it will appear. The choice of flowers will also greatly determine the degree of formality. A fabulous idea is to string flowers together to form the bottom of the trail � this threaded style has magnificent, eye-catching movement and is also fairly lightweight. Arm sheaf bouquets are long stemmed flowers and foliages that the bride carries cradled in her arm. It is a stunning alternative to more traditional styles of bouquets, the arm sheaf is very chic, and best suited to modern style weddings. The arm sheaf can be single-ended, with stems showing at one end, or double-ended with no stems showing. The style can be formal and precise or as 'messy' and casual as you desire. A striking ribbon or rope provides the finishing touch, if you wish.